I’m lucky enough to be able to take the time off my work for up to 2 weeks if necessary, so I’m going to try do as much of this thing as I can. I will have to work some evenings, but that’s a small sacrifice. Starting out from Leixlip, my first mechanical took 60 seconds – an issue with the newly installed rear mudguard stays having a minor disagreement with the chain – easily resolved and back on the road. 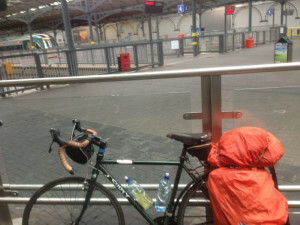 Pitstop at Heuston station after a quick spin in the N4, a random stranger asked me to mind his bike while he changed – came back in an orange jersey! That was a good start to the day, and made light work of finding the start at RTE.